I was born in St Albans, a cathedral town near London, in 1953. I spent my childhood looking at nature, deeply reflecting on the people around me and painting often. It was the happiest thing for me and still is. Having learned watercolour from my grandfather, I had several exhibitions of landscape and flower paintings. I also explored my gifts in music, learning singing with one of the leading teachers and qualifying in music therapy after a music degree in Cambridge’s Anglia Ruskin University. Alongside learning improvisation, form and texture in music, another influence on my current practice is colour theory teaching from art school (St Albans). 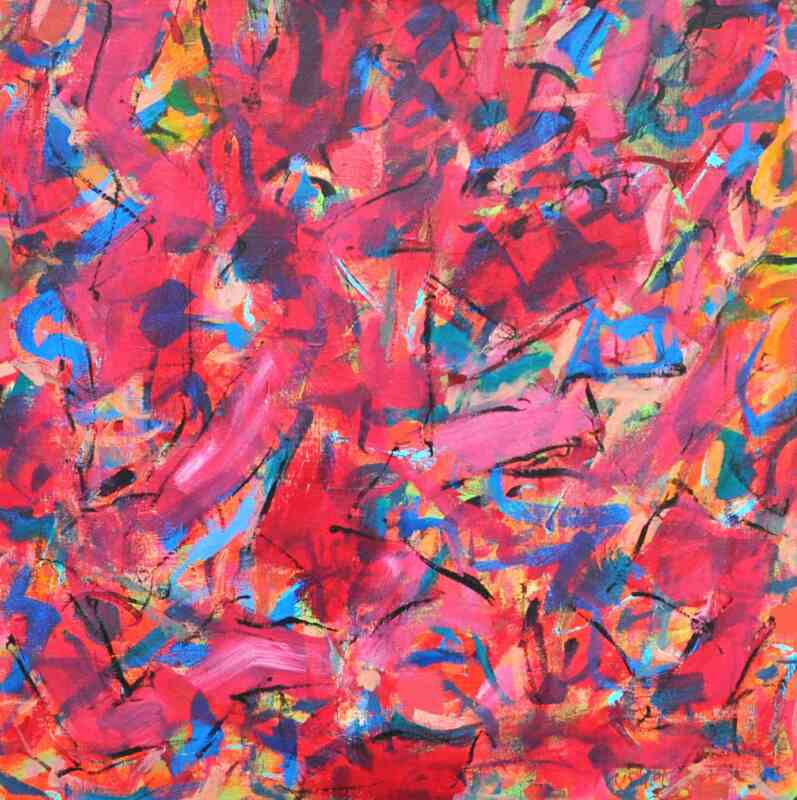 From this I have developed my own colour language in abstract painting, which began for me around 1999. I still carry on figurative work in parallel with abstraction and an important component of my abstract mark-making is life-drawing, which my husband and I practice in a group regularly in our studio. I enjoy working in many media, e.g. watercolour, pastel, charcoal, ink and clay. For painting, I enjoy the exceptional quality of Old Holland’s acrylic paint and exploring the character of each pigment. I paint transparent watery washes in the first layers and more dense paint in the upper layers with some favourite bristle or hair brushes, ranging from large to very small. Building up the paint in layers gives a sense of time and depth to the paintings and this means that the paintings also unfold in time as people look at them slowly. My themes sometimes relate to our personal spiritual relationship with God, especially with how Christ draws us out and opens up our minds and hearts. Some pictures focus on the hurtful life situations in which people may discover God’s comfort. Others look at great themes such as God’s goodness and glory. What do I want to achieve? What are my challenges? I hope to express a window on the human heart. 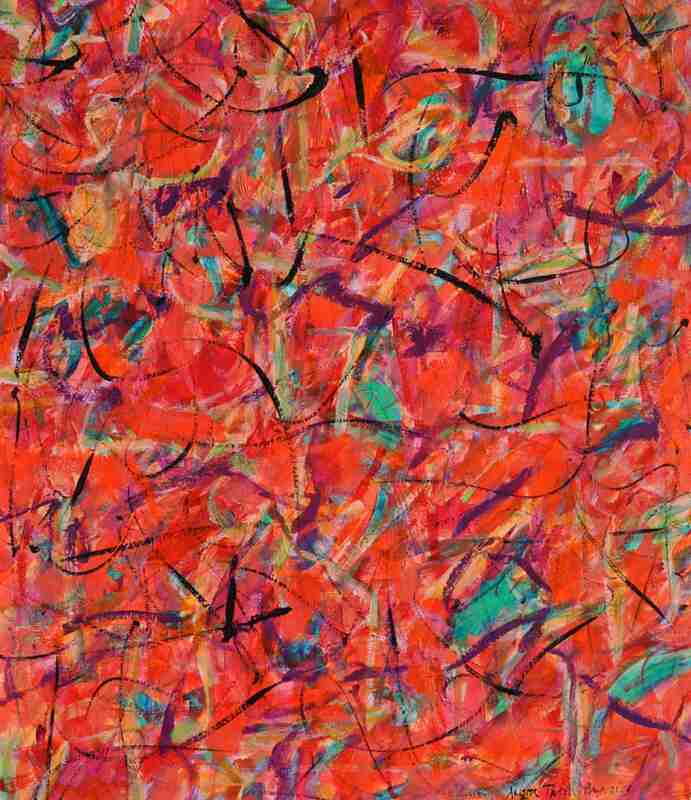 The language of abstract expressionism needs to be experienced rather than analysed, as a response to colour and gesture. A helpful way to see the paintings is to take a long look - while asking God to speak! 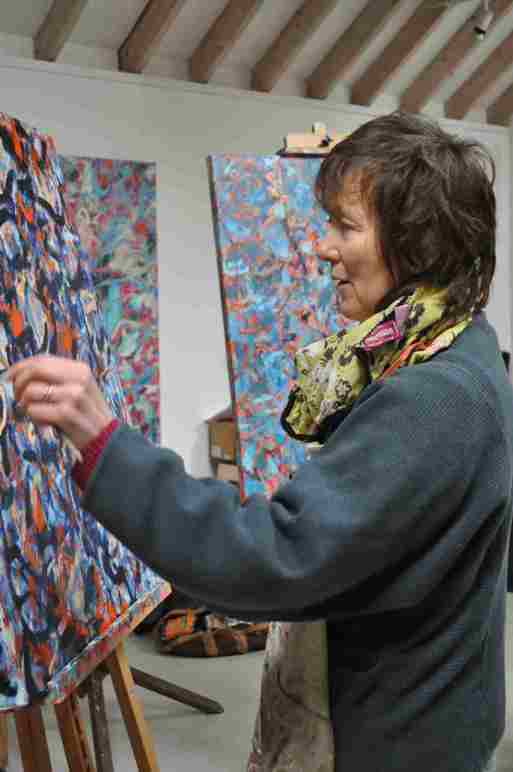 I love hearing how people have been moved by my paintings and find things in them that I have not yet seen myself. I would like them to be a catalyst in life, and to that end they are painted with great care and sometimes pain. The challenge for me is to dare to pursue some of the harder themes which as a human I have to face and to work through these in a painting, expressing passion, even outrage, until resolution comes in the peace of God. 1. 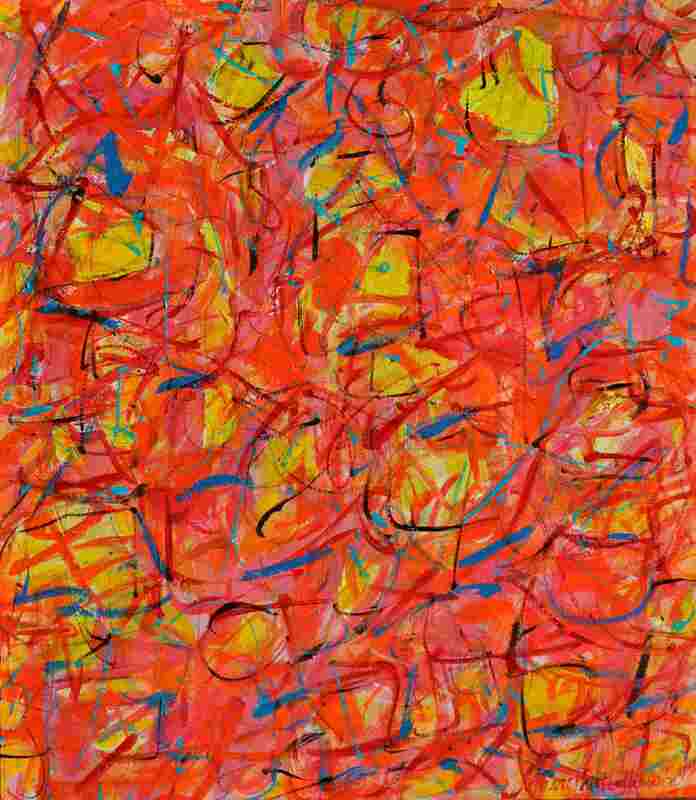 Waking up Love, 2009-10, acrylic on canvas, 91 x 122 cm. Capturing the elation of the first moment you know you are loved by God. Exhibited York Minster 2011 and Wells Cathedral 2013. 2. It’s for Everyone, 2012, acrylic on canvas, 80 x 70 cm. God’s grace reaches out to the whole world. This was one of a group of paintings on the theme of ‘A New Name’, painted to be shown at Bradford Cathedral in 2012. Exhibited Bradford Cathedral 2012 and Wells Cathedral 2013. 3. A New Day, 2012, acrylic on canvas, 80 x 70 cm. When we break through in prayer, we get a glimpse of the reality of Christ’s kingdom breaking into this world. Then it becomes ‘a new day’. Also painted in 2012 for Bradford. Exhibited Bradford Cathedral 2012 and Wells Cathedral 2013. 4. Ashes to Roses, 2012, acrylic on canvas, 61 x 61cm. One of the great blessings we find in Christ is that pain can be healed and transmuted into something beautiful. Exhibited Wells Cathedral and Peterborough Cathedral, 2013. 5. The Red Place, 2011, powder-coated steel frame with acrylic panels. For indoor display, this installation is a private contemplative space signifying the presence of the Creator in his world. Exhibited WorcesterCathedral 2011, Fresh Air Sculpture Show 2013, and Cheltenham Minster 2013. 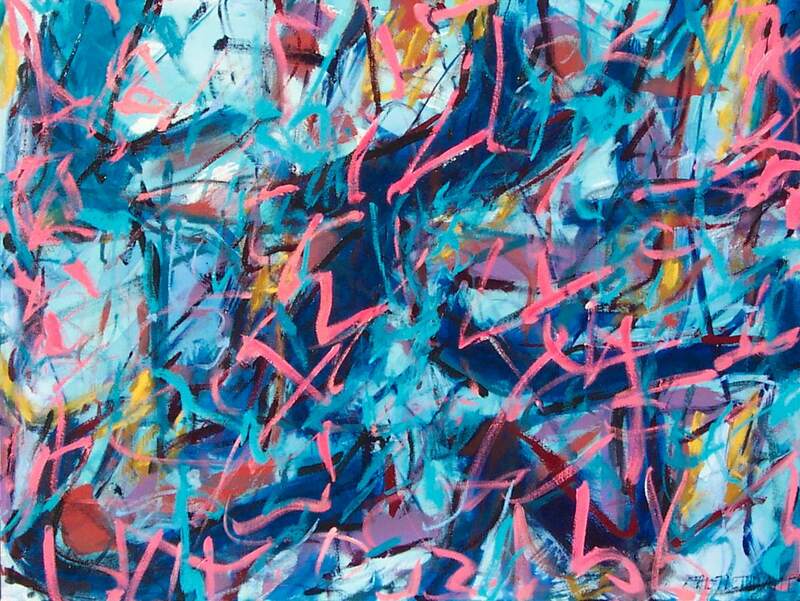 My abstract paintings have been exhibited in some of the great English cathedrals, namely York Minster and Worcester (2011), Bradford (2012), Wells and Peterborough (2013), and are in collections ins Canada, Hong Kong, South Africa and the UK. 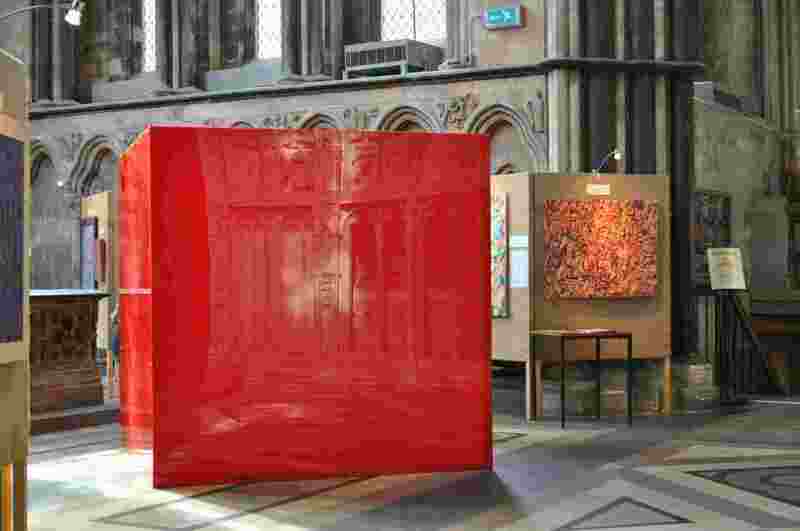 I have also produced a large installation ‘The Red Place’, a 2 metre acrylic cube signifying the presence of God, which has been shown in Worcester Cathedral and at the Fresh Air 2013 Sculpture show. The Lodge, Woodmancote, Cirencester, Gloucestershire, GL7 7EF, UK.